Whatsapp Messenger is one of the largest cross-platform mobile messaging app which allows you to exchange messages without having to pay for SMS. Do you know about the top 10 whatsapp certified figures? I advice you go check it out, to see for yourself, the rate at which the whatsapp messenger is being used. I must confess, the whatsapp messenger came unbeatable by any other social messaging app, and that's the more reason Facebook acquired whatsapp for $19million. That's a whooping sum of money. Not withstanding, the features that the whatsapp messenger acquires is so impressive with loads of features. You won't believe it if I should tell you that there are 5 things you don't know about the whatsapp messenger, and those five (5) things is based on there hidden features. I adviced you take a stroll to that post and check out the surprising things you don't know about the whatsapp messenger. Recently, there are some other trending messaging app that wants to catch up with the whatsapp messenger at fast rate, and these apps would bypass the whatsapp messenger by 2016 if care isn't taken. For now, this apps remains the best alternative to whatsapp messenger. Telegram messenger is a great social messaging app with pretty cool features. The telegram messenger has related features as the whatsapp messenger and more competitive. There are some other great achievements about the telegram messenger, like, it's free forever, no ads, messages can be accessed by multiple devices and many more features. Viber is another great alternative to whatsapp messenger, but not as good as the telegram messenger because it's not mobilized on other devices apart from the android OS. Not still withstanding, it has pretty cool features that qualifies it to be a better whatsapp alternative and also acquires the free call features which let's its users make calls within the viber messenger interface at no credit cost (as long as you have an active internet data plan). Wechat messenger is another ultimate alternative to whatsapp messenger with great features. Just like the whatsapp messenger, wechat messenger let's us send text and voice messengers to all our social friends that are also connected to wechat, and the messengers platform is very fast and interactive. Wechat messenger is available across all mobile device just like the whatsapp messenger and stand the chance to be one of the best whatsapp alternative in 2016. The Line messaging app is also a pretty cool alternative to whatsapp messenger with loads of related features. The line messaging app also let's you deliver text messages, voice messages and also video calls. This app is greatly used by over 400 million audience and it's growth is very rapid. With this app, you get to send your friends quality voice messages, video calls and fast text delivery. Kik messenger is a widely used messengers app and stands a chance to be one of the ultimate alternative to whatsapp messenger. The Kik messenger is used by over 150 million audience and it's the first smartphone messenger with a built-in browser, that is, you can chat, share and browse at the same time with the kik messenger. I would drop my pen at this junction. 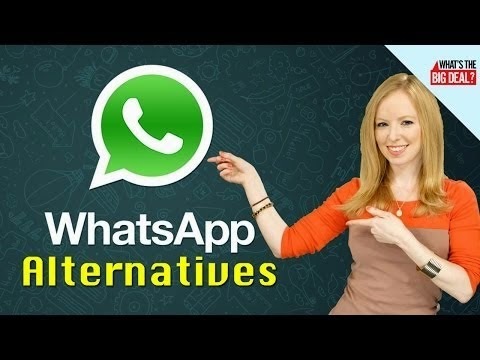 Hope that the above apps mentioned serves you as the best alternative to whatsapp. So whenever you get bored using the whatsapp messenger, you can simply make a swap and migrate to any of the mentioned apps above.